At Orheiul Vechi, Moldova, CSRM Foundation conducted landscape analysis with Light Detection and Ranging (Lidar) data. The data was collected by sensors mounted on aircraft. A Lidar sensor emits many tiny points of light, then measures how long it takes for the points to return to the sensor. These measurements are used to make precise, three-dimensional models of the ground and whatever is on it. With the Lidar data we collected at Orheiul Vechi, we were able to discern the outlines of 12 previously undiscovered fortifications. These fortifications dated from the Iron Age to Medieval times. The Lidar also revealed defensive earthworks that no one had known were there. That many different groups built major fortifications, over a long period of time, at Orheiul Vechi suggests the area’s strategic importance. 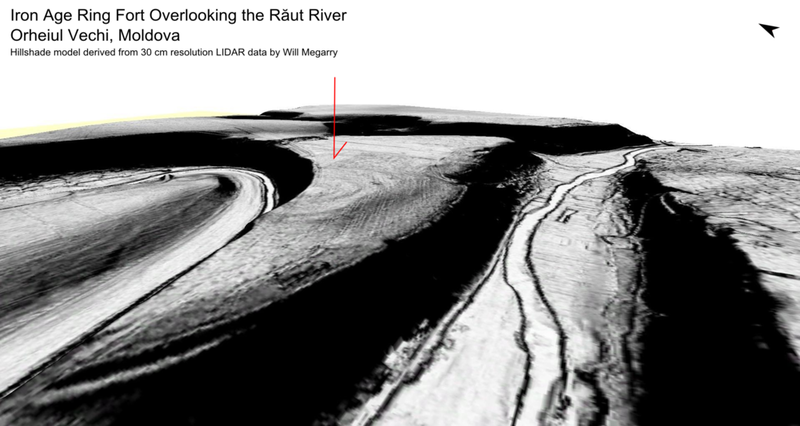 Our Lidar-derived landscape model highlighted how the natural terrain provided defensible locations that the built fortifications only strengthened: The meanders of the Ruat River, which cut deep, steep valleys across the landscape, protected the fortified sites. CSRM Foundation continues to provide technological support to archaeologists working at Orheiul Vechi and other sites in Moldova and Romania. We thank the U.S. State Department for the support and encouragement they have given us in Moldova.